Race All Day. Party All Night. The 125th Anniversary QCYC Open Regatta, home of the UK Sails Toronto Sail Giveaway, might just be the best one we've ever hosted. Make sure you get your crew together and register for the only 1-day event on the LORC regatta calendar. Race all day and party all night on Saturday, September 6th. Queen City keeps regatta racing accessible for anybody with some of the largest PHRF and Whitesail fleets at any regatta on Lake Ontario. We'll also be hosting a big IRC fleet and several one design classes. 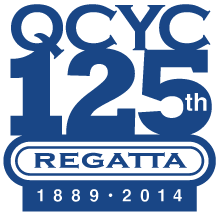 In addition to the big sail giveaway for the keel boats, there will also be a cash giveaway for the dinghy fleets, many raffle prizes and also the coveted limited-edition 125th Anniversary QCYC Open Regatta T-Shirts (check them out here!) will be up for grabs. Did I mention that there will be lots of sailing, too? Come for the late summer winds; stay for the last best regatta party of the season! For more information visit the regatta page.